Assist.Prof.Dr. Seda Kundak has been working in the field of risk assessment and vulnerability at urban scale. She participated graduate courses on natural hazards and disaster mitigation at the University of Geneva (2005), ETH Zurich (2006) and JICA Program at the Kobe University (2008). She has accomplished her post-doctoral researches at the Politecnico di Milano (2009- 2010) in the ENSURE Project (FP7). She is currently working at the I.T.U, Department of Urban and Regional Planning. Dr. Mete Başar BAYPINAR is a researcher in ITU, Department of Urban and Regional Planning. In his PhD dissertation he has studied on the effects of human capital and knowledge spillovers on regional productivity growth in Turkey during 1990-2000. He has worked in the analytical studies of Master Plan of Istanbul and Bursa and in an INTERREG IIIB ARCHIMED study. He has studies on regional integration and development in the Balkans and the Black Sea Region. 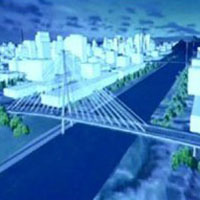 It was late April 2011 when “the Crazy Project - Canal Istanbul” was proposed by the Prime Minister of Turkey, during his election campaign. Although the idea of an artificial canal is not new, since it is initiated without any consensus between the people and institutions in Istanbul, the project immediately set a large number of debates. These vary from the legitimacy of decentralization of governance, to potential impacts of the canal on international politics, economy, environment and urban life. Regarding past infrastructure projects in Istanbul, such large scale investments have caused extensive acceleration in construction sector in one hand and social and economic shifts on the other. In this paper, the Canal Istanbul Project is evaluated according to basic motivations and claims of the PM, multi-perspective view through challenges and limitation that the project is likely to face with and speculations on implementation approach. The final discussion on the project is based on benefits/losses of Istanbul once the project will be implemented. Erkut, G.and Baypınar, M.B. (2009), “Emerging Global Integration Zones in the EU and Turkey's Spatial Integration”, Studies in Regional Science, Vol.39 No.1 pp.67-88 The Journal of the Japan Section of the RSAI (JSRSAI) PRINT ISSN 0287-6256: Sasaki Printing & Publishing. Istikbal, C. (2007) “Turkish Straits: Is it a sustainable oil route?”, Black Sea Oil and Gas Summit, Istanbul 5-6 November 2007. Yilmaz, O.F. (2010). “Beş Asırlık Kanal Projesi” (Channel Project for the last five centuries), Yedikıta, no: 18, pp: 12-21, February 2010.